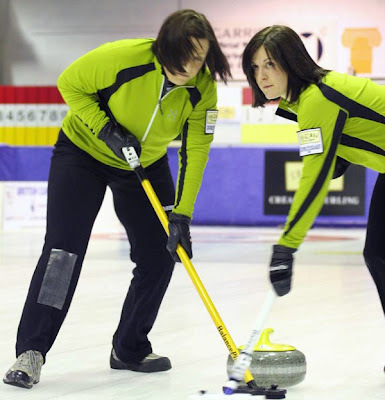 "I like the Curling Today blog, Bob, but it's just too ..... superficial. Too flippant. Not enough seriousness, analysis, depth." So the conversation went. I have resolved to change, forthwith. It was talk of the nominations that did it. You will have seen (here) that for the first time there is going to be an election for the Royal Club Vice-presidency, and even more significant, there are five candidates for the two available places as Directors on the RCCC Board. 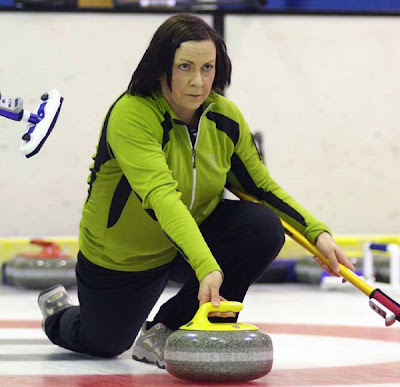 I look forward to hearing more about their platforms, and if any want to take out a full page ad on Curling Today, then my palm is waiting to be crossed. I'm totally unbiassed... "Go Bob!" No, not me. Another one. So what did talk of the nominations do? It being nomination season, why not have some nominations at Perth. I sought nominations for the Columba Cream 'Team of the Day'. There was just one anonymous nomination nominated anonymously by Edith Loudon, for Team Milne. 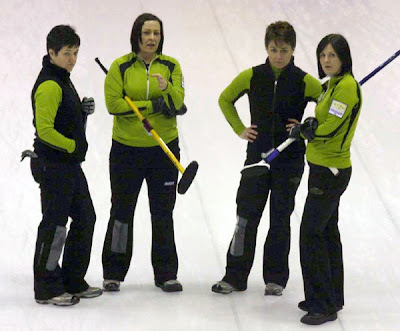 So, tonight we will look in depth at just one of Scotland's top eight women's curling teams! Here they are - Team Milne. Check out their website at www.milnemaniccurlers.co.uk. 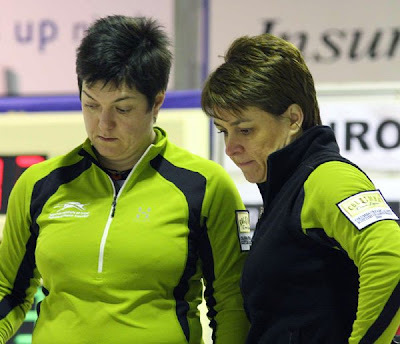 They don't yet have a fan club, but if you are a member of the Scottish Curling Forum, log in and send a personal message to Gramacho83, he could probably be persuaded to be the interim secretary! So let's start by introducing the hard working front end, above, bad hair day. Katie Loudon is the shy one on the left, and Lynn Cameron on the right. This is a bit better pic of lead Katie. She's had a long and distinguished career - see here. Ask her about her Olympic rings tattoo on her 'lower back' and if the yellow ring has faded? This is second player Lynn Cameron. She's a member of the GB Olympic Squad. You can see her profile here, where you will learn that she can fit her body through a wire coathanger! And here's the front end getting ready to do the job they're paid to do on skip Mairi Milne's stone. This is the back end. 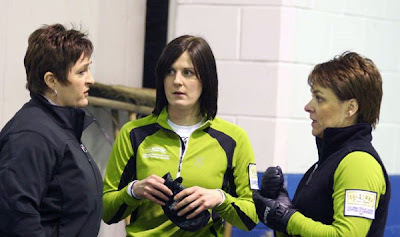 Third Claire Milne is on the left, Mairi, her sister, on the right. I would say which is older, but I prefer to think of them as twins! Whenever Team Milne competes, the stands are always packed with excited fans. They are looking for a new sponsor. Their current arrangement with Homebase Own Brand Duck Tape runs out at the end of the season. 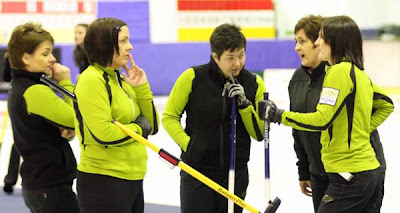 Coach Edith Loudon is an integral part of the team. A formidable competitor, she announced her retirement recently and has embraced new challenges in Wine Country, see here. Third Claire is a stalwart member of the side! 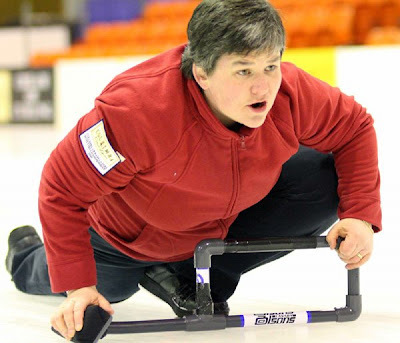 She's the local curling development officer. 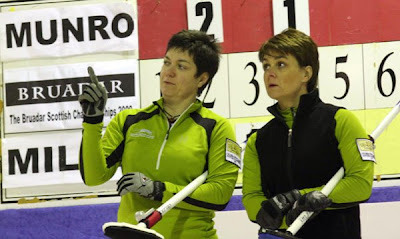 One of Team Milne's best attributes is that they approach every game with the utmost concentration. All the team are very receptive to the coach's suggestions in timeouts. And did they win tonight? Well.... no. 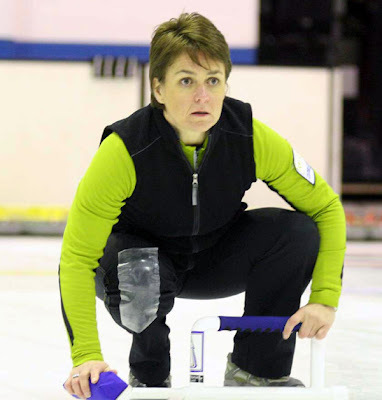 Scottish champ Gail Munro (above) did it to them in a close game that went to the last stone. 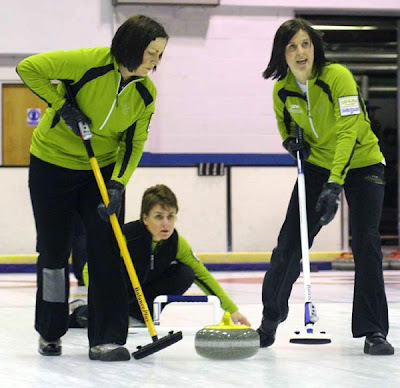 You can find all the results from all the games here, with a link to the CurlingZone stats and shooting percentages. Pics by Bob. That's all for tonight. I'm going to put the camera away now and watch some of the men's games. You know where to find the results! Back tomorrow. It's a Blog ~ tell whover suggested that you're too flippanf to "Blog off"
That was some magnificent seriousness. Well in!